Snowshovel my own driveway? Do I really want to do this? The thought of going out in the cold wet snow doesn't excite most of us. On the other hand, some look at it as yet another task that is necessary as a homeowner living in a snow belt area. Why you should shovel your driveway rather than using a snow blower. There are many reasons that you would choose to shovel rather than use a snow blower. Several of the reasons are outlined below. They are good for small areas. Perfect for smaller single car driveways/walkways and tighter areas. They are easier to maneuver. They are inexpensive when you need to repair or replace them. It is manual labor and if you practice organic lawn care, you can keep with the theme. No pollution or emissions. Requires a smaller storage space than a snow blower. Snow Shovel Designs - Which is best for you? Choosing the right snowshovel design for you is important. You should base your decision on the blade, handles and material the snow shovel is made from. Just because a snow shovel is right for me, doesn't mean it is right for everyone. Below I have outlined the differences for you. The two basic types of blades to choose from are flat blades and rounded blades. Flat Blades - Rectangular in shape. Good for deeper snow drifts. Rounded Blades - Good for pushing the snow and scooping up the snow. The handles should be the focus of your decision. Folding Handles - This type of handle is not good or practical for home snow removal. However, it is good to keep it in your car for an emergency. Ergonomic Handles - This type of handle is designed so you don't have to bend over to help reduce back strain caused by shoveling. The handle bends at a sharp angle back towards the top of the handle. Dual Handles - It looks like the handle on a lawn mower. You can maneuver the shovel with two hands and get better leverage. The material the snowshovel blade and handle is made from is very important. Metal Blades - Better to chip through the ice and carry heavier loads of snow. Strong and durable. Snow tends to stick to the blade. Good for gravel terrain. Is heavier and can contribute to back strain. Plastic Blades - Lightweight and easier for you to maneuver. Moves quickly through the snow. Snow typically doesn't stick to the blade. On the flip side.....easier to damage and can't chip through ice with the blade. Combination Blades - This is a plastic blade with a metal strip at the bottom of the blade's face. Because it is plastic it is lightweight. Because of the metal strip, you can cut through the ice. Wooden Handles - Lightweight, yet strong and durable. With the proper maintenance can last for years. Because the wood expands in the elements, you need to check the screws to be sure they are secure. In order to keep it water resistant and strong you can put a very light coat of linseed oil on the handle. Fiberglass Handles - This is the most durable type of handle which means it typically lasts the longest. The downfall is that it tends to be heavy which can contribute to back strain. Plastic Handles - Lightweight and easier for you to maneuver. Should be stored indoors so it lasts longer. Continuous exposure to the elements (sun and moisture) a plastic blade becomes brittle and will break. Metal Handles - Inexpensive and is usually made of aluminum. The blade is easy to bend and can rust if it is not dried off between uses. An electric snow shovel is also known as a power shovel, electric snow thrower and an electric shovel. It is the shape of a shovel and has a long handle. It runs on electricity. The chord attached to the shovel is typically short so you will most likely need a long outdoor extension chord. Since the chord will be in water be sure it is meant to be used outside. It works best on fresh new snow. It pulls the snow off of the ground and throws the snow in front creating a clear path. It is faster than a manual snowshovel and easier on the back. Best to use an electric snow shovel on a flat surface such as a paved driveway or walkway. 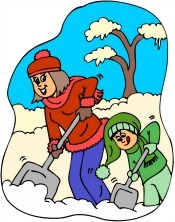 An ergonomic snow shovel helps to reduce the weight you are carrying because it is a lightweight shovel. The bent shaft helps to keep your back straight while you are shoveling. It is easier to get a good grip without having to reach all the way down the shaft of the shovel. Be sure to try out the shovel in the store before you purchase it. You want to make sure you are comfortable with it and that it is the right length for you. Go from the snowshoveling page to the snow blowing page. Consider having the kids help out. Kids like to mimic what their parents are doing and when they are younger they like to help with chores. A kids snow shovel is pretty inexpensive. Besides, being out in the fresh air along with the exercise will wear them down and they may even take a nap. Snowshoveling can be a daunting task. Why not make it as easy as possible on yourself. If you are elderly or have a medical condition, leave the shoveling to someone else. Gently stretch your muscles before you leave the house. Make sure your clothes are layered and don't forget the hat and gloves. As you scoop the snow, bend your knees and lift with your legs. 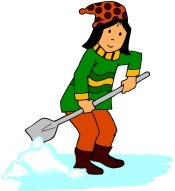 Keep the shovel blade near your body as you lift the snow so you don't strain your back. Keep switching hands with the shovel. Switch your grip often (palms up or down). When the snowfall is more than one foot, don't shovel down to the pavement with one scoop. Instead scoop half, then redo the same spot a second time. Don't feel as though you cannot take a break. Rest as necessary. Don't over do it. If you don't have any health conditions, shoveling snow is good exercise. A 155 lb person can burn a little over 400 calories per hour. Snow sticking to the shovels blade? 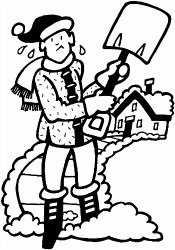 Before you begin shoveling put a little wax on the blade of the shovel. You can use anything you have handy: car wax, floor wax, candle wax. Have a can of PAM, that will work too. Just got another 4 or so inches of snow today. A friend of mine is testing out her new toy, a brand new electric snow shovel/power snow shovel. She said "it's just like vacuuming".